Sitting in the top end of the Willetton market and originally valued prior to the makeover at around $950,000 this 5 bedroom 2 bathroom home had a lot to offer buyers in terms of space but its interior was outdated and tired – coming from the 1980-1990s era. Investors and renovators typically want to purchase at a hefty discount against the market price where as home owners want to buy a home that is fresh and they can simply move into without having to do anything. So where is the value for the Seller, between the discount of a renovator and a premium buyer who wants to simply move in! Featuring open brick walls indoors, as well as a peachy toned kitchen, this house was cluttered and in desperate need of some touch ups to modernise and freshen it up, to appeal to premium buyers in the market. After completing a Ready4Sale Gold consultation the client decided to go ahead and engaged Spruce Ups to project manage the makeover and implement recommendations provided to them in the gold report. It is important when preparing a home for sale to minimise costs. 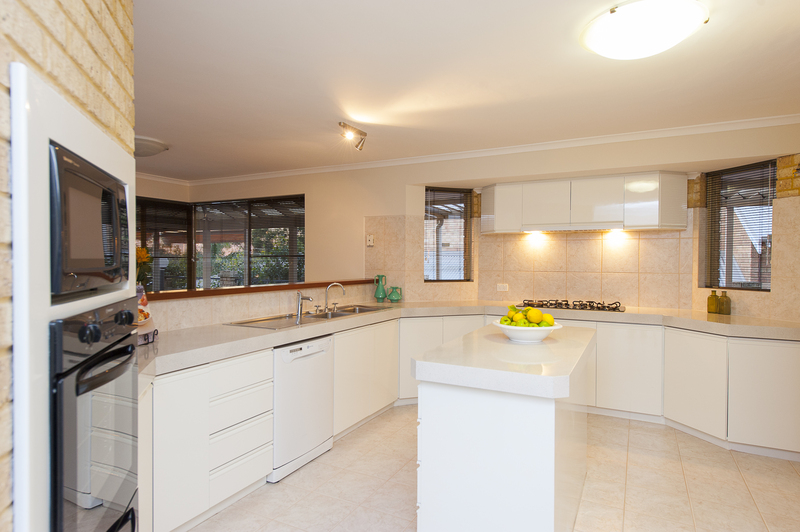 The layout of this kitchen was good and a renovation would have been expensive, taken longer and ultimately the cost could not be recovered at sale. Instead resurfacing the kitchen modernises the look and feel instantly. A great environmentally friendly option - Finished in a modern white high gloss and marble style benchtop. Open brick indoors and low dividing walls close in rooms and are outdated and old-fashioned. Buyers today are more often than not drawn to open plan living. By removing this wall we were able to open the space, making it buyer friendly and creating the feel of modern open plan living. Covering up the open brick wall instantly makes the place feel younger. When the owner put their property on the market it was the most expensive in the Willetton area, selling for an additional 26% above their original appraisal. Time on the market 23 days, 18 days lower than the market average of 41 days (sold as an expression of interest).